Kelly shared the first photo of her baby bump on her Instagram account on Thursday, June 19. 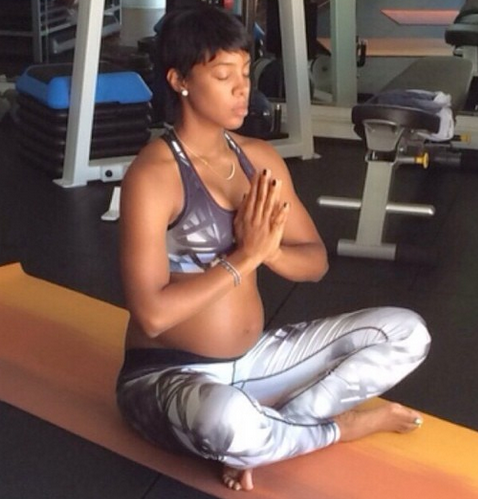 In the photo, Kelly appears to be meditating on a yoga mat at the gym. Her growing baby bump is on display thanks to the fact that Kelly is wearing a sports bra, which leaves her abdomen uncovered. One thing is for sure: Kelly looks absolutely gorgeous! Her new-mom glow is radiating off of her as she finds her inner peace. So beautiful! Kelly first announced that she was pregnant by sharing a photo of two pairs of sneakers on Instagram. One pair presumably belonging to her husband, Tim, and the other a tiny size made for a baby boy. “I’ll be stuntin like my daddy…..,” the singer wrote, teasing her fans. This will be Kelly’s first child with her husband, Tim Witherspoon. Am so happy for the R&B singer, may God bless and protect her and the baby for us, her teaming fans #DoroKelly #Doro everything around her in Jesus name - Amen!